Bigasoft AVI Converter can help you easily convert all popular video files to AVI, MPEG or MPG for watching your favorite movies with ease. With the ability of decoding video files like WMV, ASF, MKV, 3GP, MP4, AVCHD, H.264 AVC, MOV, RM, AVI, Xvid, DivX, MPEG, Bigasoft AVI Converter is able to transcode any movies to AVI, MPEG or MPG. 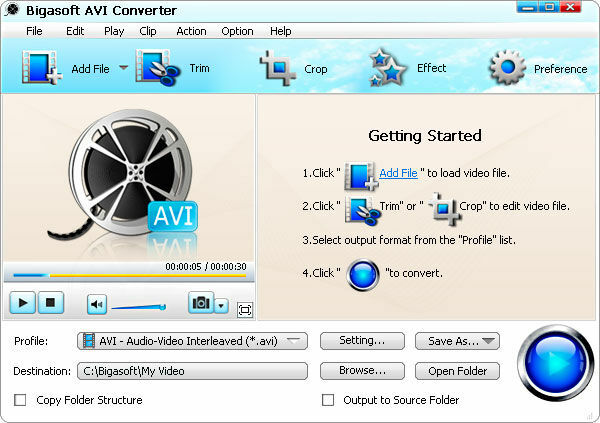 Moreover, the ultimate AVI converter supports much more features including video editing, batch conversion, etc.